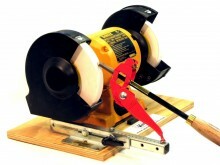 Special This month only get the TruGrind sharpening jig and the Timberly Spacer set for $226.00 plus post. We recommend the Timberly spacer set for ease of setup and a uniform grind every time. Your Woodcut grinding system is designed to provide wood turners with a device which enables them to grind perfect bevels on deep and shal­low gouges, roughing gouges, skews and scrapers. Once the grinding fixture is setup as described, grinding a perfect bevel on a tool takes but a couple of minutes. You can then savor the joy of turning with a really sharp tool. The hollow ground bevel will also give you the ability to hone the edge easily and get it really, really sharp. Such a truly sharp tool will en­able you to turn wood to a finish so smooth that the end grain requires no sanding. When I first started turning I tried to hand sharpen my tools, I not only wasted metal every time I went back to the wood I had to learn to turn with a new bevel angle. This system soon paid for itself as I was grinding less, only touching up the edge so I was sharpening not grinding. As the finish was better I saved metres of sandpaper as well. I have tried many systems on the market and have found the TruGrind to be the most user friendly. Remember I only sell what I have used and tested and proved to withstand my vigorous use. A white wheel is recomended for HSS chisels. Dressing your wheel can prevent blueing and gives a better edge. The set comes with Base and tool holder very easy to install comes with cd and instructions. Hello! cfcdekg interesting cfcdekg site! I'm really like it! Very, very cfcdekg good! Click the button below to add the The Woodcut TruGrind Tool Sharpening System SPECIAL to your wish list.